The GE is two things in one, it’s a three days and two nights of ziplining and trekking through the jungle of Laos, and its also a way to protect a vast area of forest at a time when the entire country is being logged at an alarming rate. I was in no shape to hike, my left foot had a strange burn from a mosquito repellent candle that itched and was turning weird colors, there was a gash on my heel from diving that wasn’t healing, and my toe had a blister from the previous hike that had caused my big toe to double in size so I couldn’t get it in a shoe. My right foot was still weak from my previous sprain. But I stubbornly told Tim there was no way I was letting some bruises keep me from this trek, so I hiked the whole three days in flip flops (and slowly…and with Tim sometimes carrying my backpack). Laos is cool in January so it was ideal for hiking. It was in the high 60s during the day and low 60s at night. 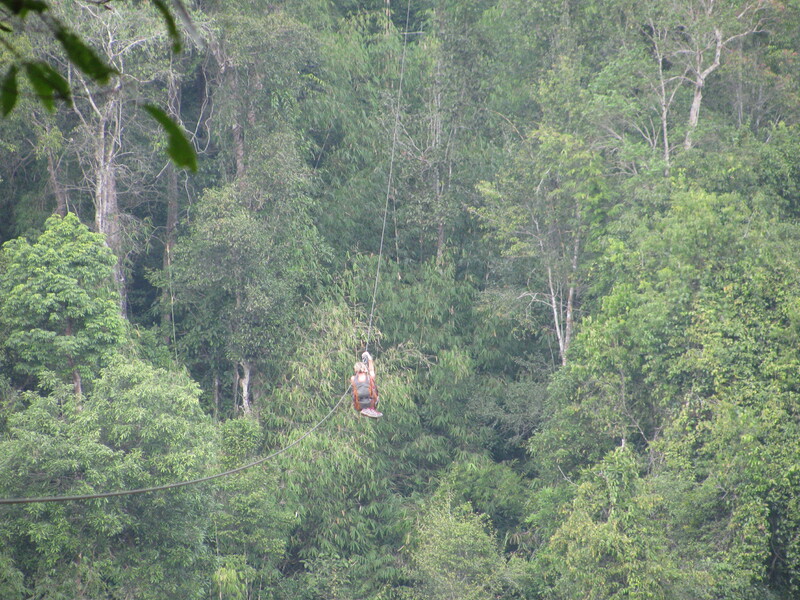 It took us some time to get out to the reserve and hike to start of the zip lines, but once we did it was a nice routine of hiking and zipping for another hour and a half. the lines are long and you rely on the far off “okayyy” as your signal to launch yourself on a line. At that point you find yourself 150 meters above a sprawling forest – it’s an angle I’ve never found myself at before despite doing zipline tours in the past. 5 zips with the guide, to attach yourself to a cable 150 meters off the ground and do your thing, with no one there to check if you were doing it right! This was especially frightening at first because the zip out of the treehouse forces you to sit on a plank of wood outside the tree house in order to launch yourself back to the forest landing. The cool thing though, is once you get used to clipping yourself in and going its the most freeing feeling in the world. 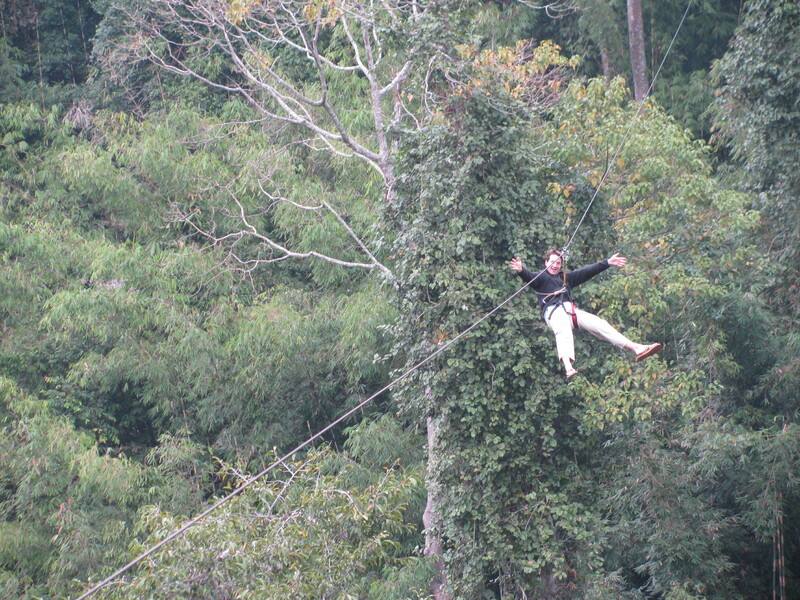 You feel a little bit like you are the gibbon making your way across the canopy. The second day we went to a waterfall. 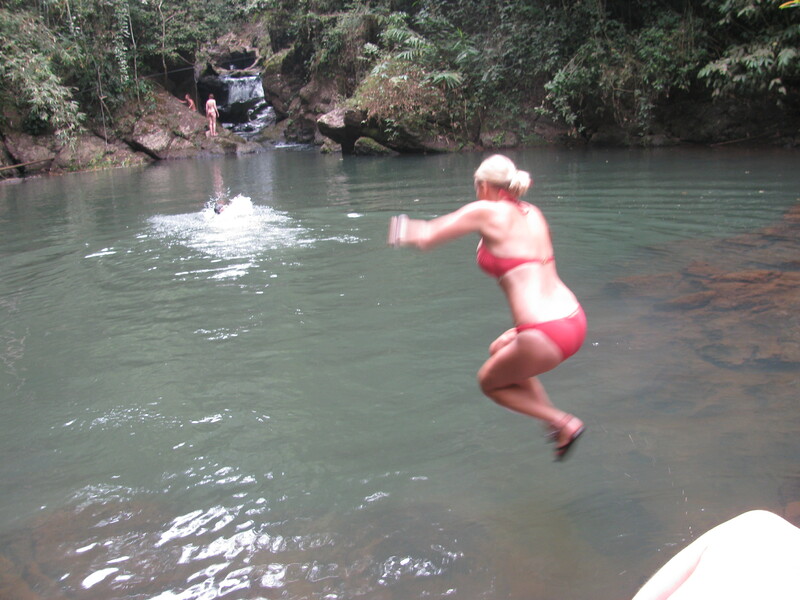 It wasn’t much of a waterfall and the water was freezing, but we all jumped in anyway. Nothing has ever taken my breath away like the leap into that river, and I will never in my life jump in 50 degree water when the temperature outside is maybe 65. But I don’t think any of us regret going for a swim that day. 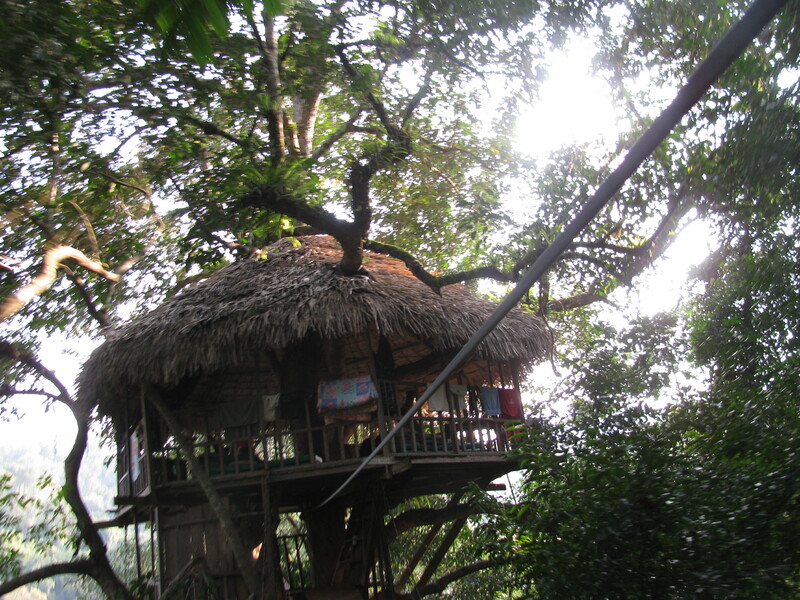 We zipped around again on our way to a second tree house. 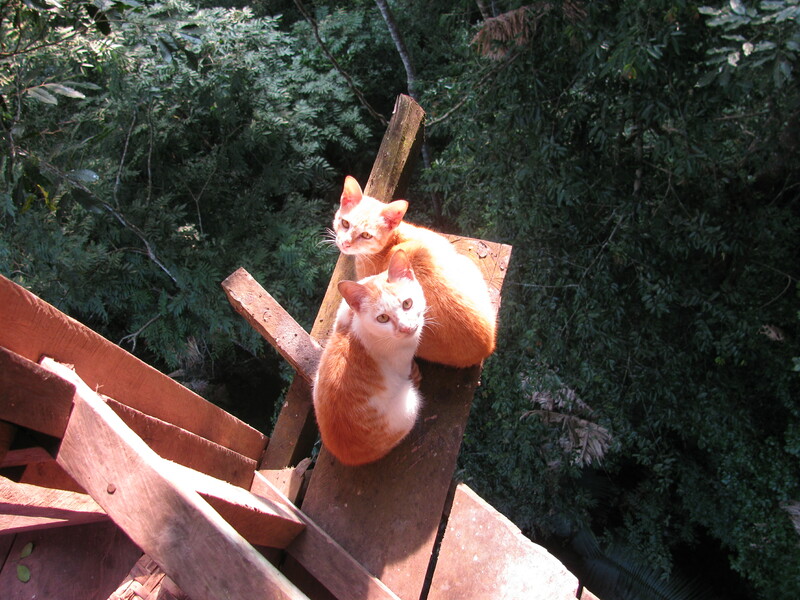 This tree house was smaller, but had cats in residence that seemed to really enjoy being adopted anew every night by travelers. We enjoyed having the local food zipped in, as we did the night before, and settled into laughing and playing cards into the night. By the third day, it seemed as if the trip had passed all too quickly, but we made the most of being back in town. 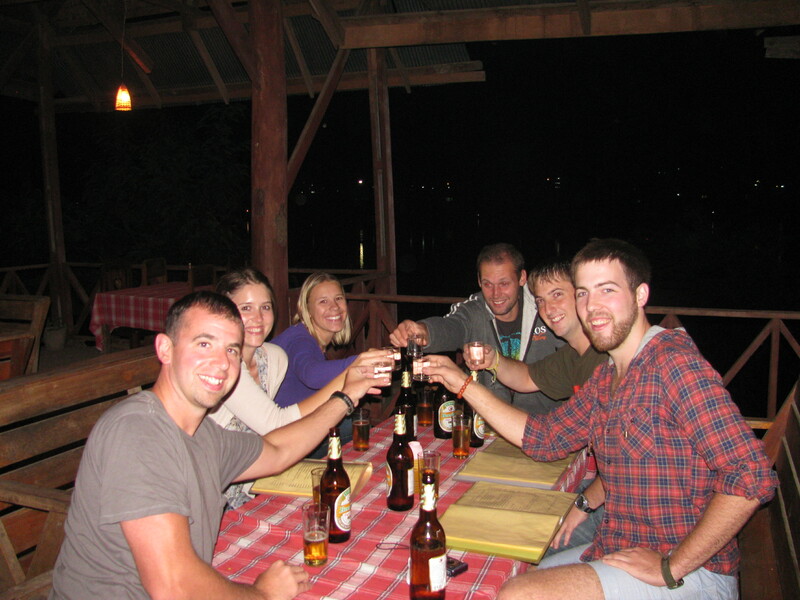 We all enjoyed dinner on the water, complete with a little too much Lao Lao (potent Lao whiskey). I really enjoyed reading your blog, i was planning to backpack through laos and wanted some advice on the itinerary. 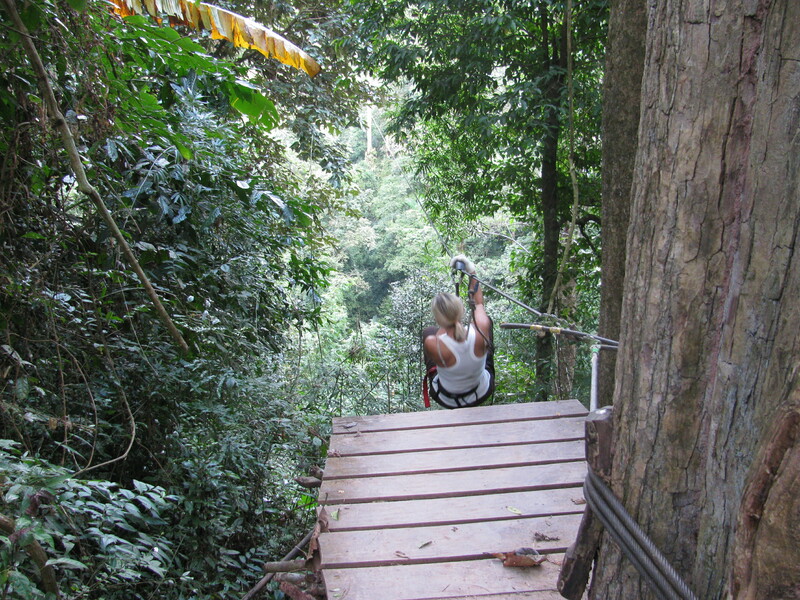 I want to cover Luang Prabang, Vang Vieng, Vientiane and also the gibbon experience. Can you please advise what Itinerary should be best. I will reach Vientiane from bangkok and I have max 8-10 days for Laos. 8-10 days in not a lot of time at all for getting yourself around Laos. You probably want to spend only 1 night in Vientiane, bus to Vang Vieng for 2 nights, bus to Luang Prabang for 3 nights, and then take the long boat to Huay Xai (you’ll have to stay over one night at a half way point because it takes two days), You’ll probably need a day before and after the gibbon experience in Huay Xai too, and 2 nights for the gibbon experience so that is 11 nights already, and then you would want to boarder cross to Chiang Rai or Chiang Mai to fly back to Bangkok. You could leave out Vang Vieng because there’s not much to do but get drunk and tube down a river but its up to you. I hear that there are some speed boats which take 6 hours for a trip between luang prabang – Huay Xai. Yes, you can take a speedboat but its ridiculously unsafe/uncomfortable (you have to wear helmets and life vests the full 6 hours and they don’t do much if you crash) so do more research before you decide to do that to save time. Both boats arrive at Huay Xai, the slow boat takes two days because it is more leisurely, but worth it.